Welcome to On The Move Coaches, Inc. where we provide quality motorcoach and Flint charter bus service. Experienced in safety, you will find that we are a company of professionalism, reliability, and dependability to meet all of our customer’s needs. We assure that we have the best quality service as well as the best drivers. Choose On The Move Coaches, Inc. to assist you and your group with safe travels in a timely fashion. Safety, quality, and compliance with federal regulations are three important things to consider when selecting a motorcoach carrier. A quality motorcoach operator is one who is professional and provides outstanding service to its customers. Also, it is great to consider the carrier who is most affordable and can meet all of your needs. On The Move Coaches can provide you with the quality service that is most affordable with competitive pricing. Selecting On The Move Coaches as your motorcoach or Flint charter bus carrier, we will be sure to remain reliable, maintain cleanliness, and provide on duty dispatchers. On The Move Coaches specializes in a number of trips in and around the Flint, MI area. Book one of our trips to the many casinos. 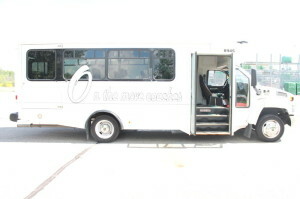 On The Move Coaches also can assist with fundraising trips. Having a wedding, going to the prom, or have a need for classy limousine service? On The Move Coaches is your provider. Flint Party bus service is also available.